Matt Sawyer of Dojo North Software has written to let us know that he has released version 2 of his highly useful and popular Home Server SMART Add-In for Windows Home Server. The release adds continuous, automatic monitoring and alerting, plus support for USB hard drives. Matt has also announced that he is beginning to work on a version of Home Server SMART for Windows Home Server 2011 and Small Business Server Essentials. Here is the full release announcement including download links. After many months in beta, I have finally released version 2 of Home Server SMART! HSS v2.0.8.25 includes a number of features many folks have been asking for, including automatic, continuous disk monitoring and support for USB disks. While these features were available in the public beta, many folks don’t participate in a beta and so for many these features will be brand new. 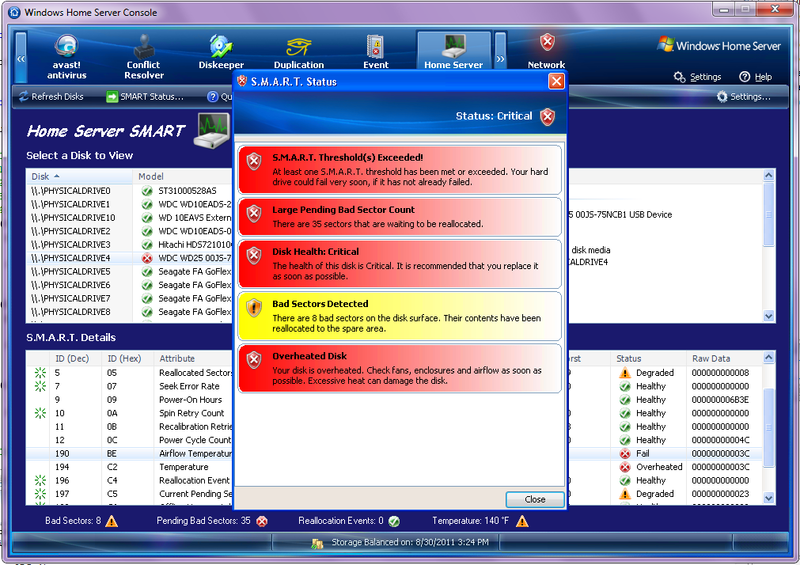 If a disk’s health starts to degrade, HSS raises an alert within WHS, either Warning or Critical (depending on severity), which results in the standard WHS tooltip popping up on each connected computer. For those folks who have installed Alex Kuretz’s Remote Notification add-in, you can be notified of degraded or failing disks even if you are away from your home. The UI received quite a bit of work, including new visual health indicators in the disk selector. These provide the user with an “at a glance” view of the health of each disk, without needing to visit each disk individually. Descriptive help text is now provided for every SMART attribute on each disk. Simply double-click on any attribute, whether or not it’s healthy, and you’ll get a detailed explanation of the attribute, and also an indicator of whether or not that attribute is in an unhealthy state for that particular disk. Another new feature is the ability to ignore certain problems within HSS itself. If you have a disk with a low number of bad sectors, for instance, and the problem isn’t getting any worse, you can click an Ignore Problem button while the attribute in question is highlighted. HSS will stop generating an alert for this item—as long as it doesn’t get any worse. If the problem worsens, HSS will let you know. Not every problem can be ignored however. If a SMART threshold is violated, per the specification this is a catastrophic failure condition and cannot be ignored. The last new feature to be implemented was an update checker. If you go into Home Server SMART’s Settings, under the Resources tab, click the Check button to see if an update is available. There were plenty of bug fixes as well. The pesky null reference exception and WMI “not supported” messages should finally be laid to rest. Some Silicon Image (SiI) controllers weren’t displaying any data, but are now. Some users encountered console crashes when performing a manual refresh. There were also a number of bugs that popped up during the beta that were resolved as the beta progressed. Numerous changes were also implemented. Several things were cosmetic, like button icon changes. Others were more significant, like changing how data was stored and read from the Registry to improve UI response times, as well as consolidating modules to cut down on the add-in’s footprint on the server and in terms of memory consumption. There is a major known issue – some folks with SiI controllers are not getting any SMART data in any version of Home Server SMART. I don’t know if this is the result of a change in drivers, or user configuration of drives. Because I am not an “SiI partner,” they won’t release their driver API to me so I don’t have any realistic way to research it further. Please visit the Home Server SMART page to download the add-in. 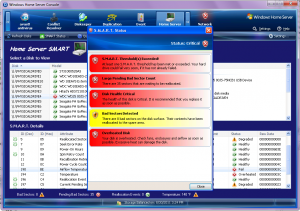 The help file, provided with the add-in, is available as a standalone download. This help file includes the full release notes including all new features, changes, bug fixes and known issues. 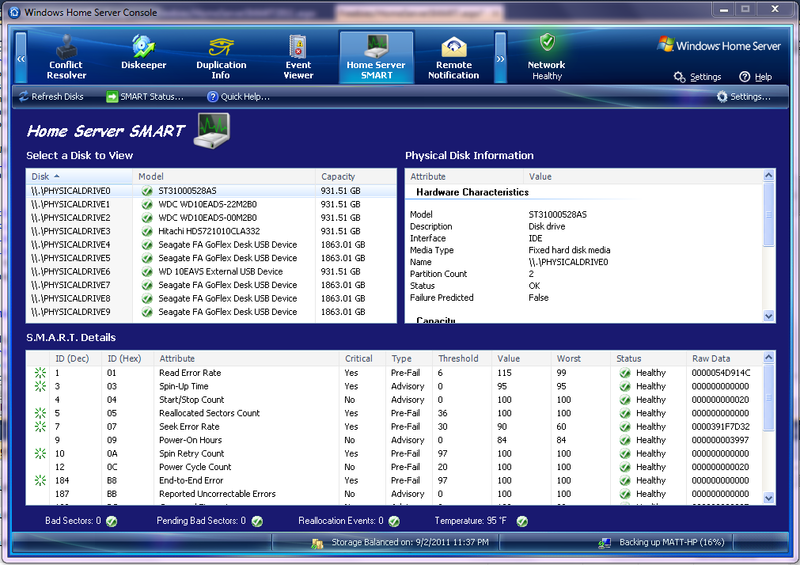 Visit the Home Server SMART Homepage for more information and to download the Add-In. For WHS 2011 users, there is good news! I got another server this week, an EX487, and have WHS 2011 installed. Now that v2 of HSS is out for WHS v1, I can start working on HSS for WHS 2011. Please check here for more details. 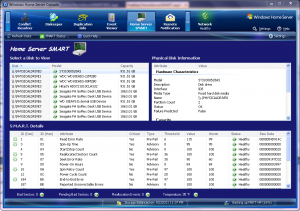 Home Server SMART is, and always will be, 100% free for you to download and use. There are no ads, no spyware, no annoying pop-ups and no prompts asking for you to register. The software will be fully operational and full featured all the time. Home Server SMART does, however, represent the result of hundreds of hours of work… researching SMART, buying new hardware, coding the application, debugging, fixing bugs, following up with beta testers, more testing, etc. If you like this add-in and find it useful, and would like to show a small token of appreciation, please make a donation at the link below. This is not required, but is certainly appreciated. High 5 to Matt for continued developement on an already great ADD-IN one of the must haves for good Preventative Maintenance on any Windows Home Server. I look forward to his WHS2011 release. Thanks Alex for the post, and thanks Comp1962 for the feedback. One issue popped up after deployment, and that had to do with users not having the Microsoft Visual C++ 2008 Runtime installed on their WHS. One user reported diagnostic information back to me–something that never came up in the beta–that made this problem quite clear. The resolution was to make an additional download available — there is a small download package which does NOT include the Runtime. If you know FOR SURE that you have the VC++ 2008 (or later) Runtime installed, use the regular download. If you don’t have it installed, or aren’t sure, choose the one with the Runtime bundled, and the installer will install the necessary modules. The next release will consist of just one download with the Runtime included to eliminate confusion. If you find a bug, or want a new feature, please visit https://www.dojonorthsoftware.net/bugtraq to submit your item. Dave, this seems to be a limitation in several utilities including Crystal Disk Info. I can only get 4/5 drives on any Silicon Image port multiplier enclosures and only when all 5 drives are online. I think all of these utilities use the same libraries which fail to read the drives properly. It doesn’t seem that difficult… they all have drive letters!! !